This post has nothing to do with moving to France unless of course you want to earn some extra money towards your future move- which is exactly what I did. Here are my personal tips on what to do and bring for your next craft show. 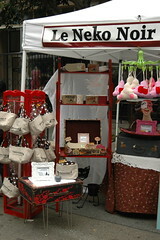 When I first started selling my handmade goods, I was selling solely online. Then I discovered the world of craft shows and although they are a lot of work to put together, it gets easier and easier. Plus Craft Fairs are an excellent way to make some extra money on the weekends, and you can eventually grow it into a full-time income if you want. 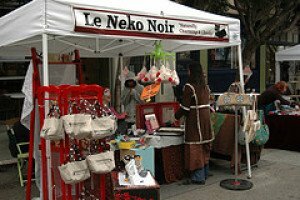 I did my first craft show in San Francisco back in October of 2009. It was called the “Union Street Design Festival”. It was the first of many. I agonized over what to bring the entire month before the show. We did a few dry runs, setting up my booth and trying making sure it all fit in the car. We kept forgetting to do or bring something so my husband and I created a craft fair checklist of things we knew we had to bring. The list eliminated the need to think about what to bring. For each of my craft fairs after that, I did not have to think about what I needed to bring. I just carried the list around and checked things off as I gathered them. This list isn’t exhaustive, and many things are optional, but other things are a must. I hope it gives you a good starting point for you to build upon. Just use common sense and your best judgment. Make sure you do some test runs and also make sure it all fits in your vehicle. MONEY: Will you be accepting credit cards or only cash? 1. Cash: Bring at least $100 worth of change in different denominations and a box or a utility apron to hold the cash. The last thing you want is for someone to hand you a twenty and not be able to make change for their purchase. Oh, and another thing, price your items using round dollar amounts. So instead of $19.50, and giving 50 cents for change, just charge $19.00 or $20.00. Much simpler. You could also build the sales tax into your prices too. It just makes things so much easier when you’re conducting each transaction. 2. Credit Card: Accepting credit cards is easier than you think. I used propay and opened an account online. You could just as easily use PayPal or some other service. Those two seemed to be the most popular. I bought a credit card imprinter on eBay along with some credit card slips for under $30 dollars. You actually don’t even need a credit card imprinter. You could just write down each credit card transaction by hand. I found it easier to swipe the card. This gave me an imprint of the credit card information and it proves that the card was physically their. I then only had to check their signature and I.D. and ask for their zip code. I then went home and entered their info into my web-based propay account and voila! Their credit card was charged and the money is in my account within a few days. 3. Receipt book: It just makes sense that you have some way to record all of your sales from craft fairs. How else will you know how much money you made on an ongoing basis? Record the date, the item, the quantity, the location/fair, price etc. Then when you get home you can enter it into your spreadsheet, accounting software, quicken or wherever you enter your sales usually. 4. Business cards: o promote your website. Lots of people were perusing and checking things out but not buying. Make sure you put out your business cards so people can take one with them in case they want to buy later at your online retail store. If you don’t have an online presence, think about starting up a store at a place like Etsy.com. 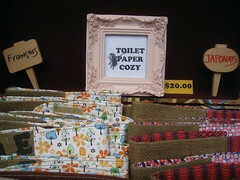 Lot’s of craft fair goers have their store through Etsy. Check it out! 5. Other promotional Material: I brought bookmarks that i had made up for less then $50 dollars. On one side I had my store name logo and on the other side I had some pictures of my items that I was selling. You could just as easily bring post cards. Pass these out or let customers take them. Also, give one away with each purchase. 6. Banner or Large sign: I had a vinyl banner that I put up on my tent. It was a 1 ft x 8ft banner that went across the top of my tent. I found a printer on Etsy who made it for me in less than a week for around $60.00. That’s pretty cheap. You could also create your own and hang it inside your tent or pin it to the front of your display table. 7. Paper: to record names, orders, email sign up list, take notes, doodle…. 17. Containers. You’ll need a system to carry all this. Large Tupperware, Small Suitcase. Whatever works. 18. 10 x 10 tent. Preferably white. If you plan on doing many craft fairs, then I highly recommend getting a tent. Not everyone at the fair had a tent. I liked having a tent because i was semi-protected from the elements. If your event is indoors then you probably won’t need one. Whatever you decide, shop around. I got an EZ up tent on eBay for a few hundred dollars. 19. Weights for your tent: I’ve seen the wind take up tens that were not weighed down. So you’ll need to have something to hold down each of the 4 corners of your tent. At least 15 pounds for each leg. 20 is the recommended weight. We used old burlap rice sacks and filled them up with pebbles. Alternatively, you could fill buckets up with sand. Or, you could go to the thrift store and get some old weights and tie them to your tent legs. 20. Display tables: I used two card tables and placed them side by side. Others brought longer tables. and still others just had a single table with their wares and no tent. So it’s up to you and your situation. 21. Table cover: Use old sheets, Drapes, Table cloths or whatever else you can get your hands on. I found a bunch of really cute table clothes at the thrift store for under 10 dollars. Make sure the table cloth is long enough to reach the ground on all sides. I hid many of my things under the tables out of sight. 22. Display signs, Prices: You could individually price each item. Or if you could create price areas. I used small picture frames and put the price of that group of items on or in the frame. Here’s an example. 23. Displays to showcase your work. I brought bowls, suitcases, shelves. Definitely try different things and see what works. I re purposed some things i had laying around and also found some thrift store finds which i cleaned up. In the photo below, I put legs on a suitcase which did double duty as a display and to store my crafts. I re purposed a leaning bookshelf by painting it red. I hung things from the top of my tent using a laundry dryer i found at Ikea. My point is, you can be creative and don’t need to spend tons of money. You just need a little time and creativity. 24. Chairs or Stools: I brought some directors chairs. They were light and folded up. 27. A helper so you can get a potty break or buy a lunch. Or get cozy with your neighbor at the fair and ask if they can watch your stuff while you are gone. 28. Work: Bring some crafts you can work on to pass the time during slow times. 29. Inventory list of all the things your bringing to the show. 30. Inventory: don’t forget to bring your crafts for the show. And extra inventory to replenish things sold. Since moving to France, I no longer do craft fair shows or make sleeping mask. You can read the about me page to learn more about living in France.